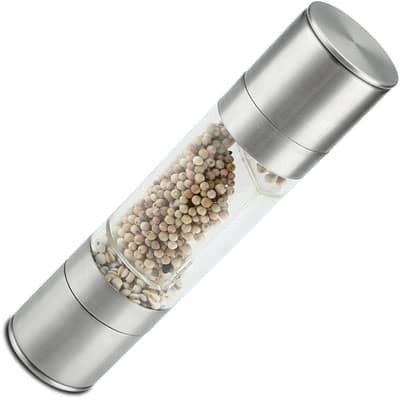 Add a modern and high-end touch to your counter and dining room table with this sleek 2-in-1 Stainless Steel Manual Pepper/Salt/Spice Mill Grinder! This space-saving design combines two shakers in one. A tight seal and stainless steel dust caps keeps your seasonings hygienically fresh and moisture free. 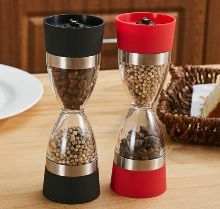 A simple, easy twist livens up any meal; the adjustable grinder lets you choose from very course seasoning to a finer grind. 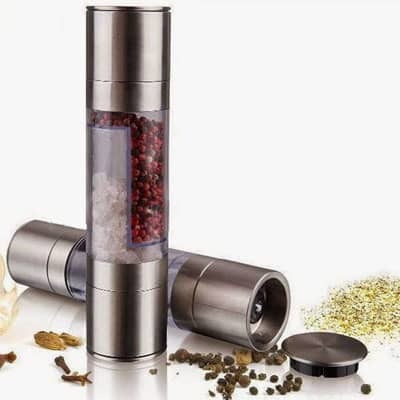 PRODUCT DESCRIPTION: * Innovative pepper mill dispenses spice with speed and ease. * Adjust tightness can control the milled seasoning size (course to fine). * Suitable for milling pepper, salt, and other small sized spices. * Material: Sturdy stainless steel and acrylic. * Simple assembly and disassembly for easy cleaning. 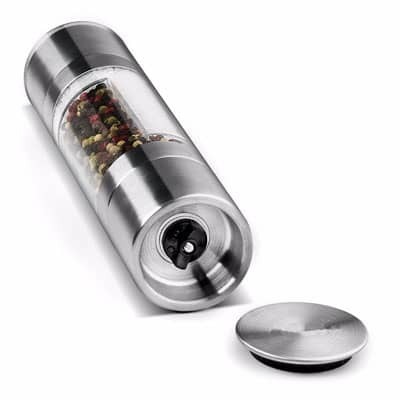 Add a modern and high-end touch to your counter and dining room table with this sleek 2-in-1 Stainless Steel Manual Pepper/Salt/Spice Mill Grinder! This space-saving design combines two shakers in one. A tight seal and stainless steel dust caps keeps your seasonings hygienically fresh and moisture free. A simple, easy twist livens up any meal; the adjustable grinder lets you choose from very course seasoning to a finer grind. 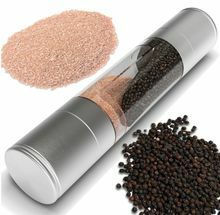 * Innovative pepper mill dispenses spice with speed and ease. * Adjust tightness can control the milled seasoning size (course to fine). * Suitable for milling pepper, salt, and other small sized spices. * Material: Sturdy stainless steel and acrylic. * Simple assembly and disassembly for easy cleaning.